Productions that are running now, planned for the future or that have been on stage recently are listed on this page in two sections. The first section covers Balally Players events. The second section below that, Other Events, has information on plays and events presented by other groups and organisations. To have an event included here, send details to the Committee using the form on the Contact page. The Members' Area has a Balally Players Calendar of Events that covers a period of six months from and prior to the current month. One of Dickens’s best-loved novels brought to life in a beautifully simple adaptation for the stage directed by Brian Molloy. Set in the south of England during the first half of the nineteenth century, ‘Great Expectations’ by Charles Dickens, has some of his most memorable scenes and best loved characters. From the opening in a graveyard, where the young Pip encounters the escaped convict, Abel Magwitch, the story goes on to introduce other memorable creations such as the eccentric Miss Havisham, the beautiful but cold Estella, and Joe, the unsophisticated and kind blacksmith. Originally published as a serial in Dickens' weekly periodical ‘All the Year Round’, between December 1860 and August 1861, the story explores social issues of his day through the lives of rich and poor and a struggle between good and evil. From the time of its first publication, ‘Great Expectations’ delivered on what was expected – almost everyone loved it. There were of course some dissenting reviews. Thomas Carlyle, the Scottish philosopher, satirical writer, essayist, translator, historian, mathematician and teacher, considered it to be "Pip nonsense", while reportedly reading each new instalment with "roars of laughter." On the other hand, George Bernard Shaw said it was "all of one piece and consistently truthful”. The public sided with the view of the Irish playwright and critic over the opinion of the Scottish thinker famous for developing the Carlyle Circle – ‘ruler-and-compass constructions of regular polygons’ – a publication devoid of laughter for all but the most excitable mathematician! Dickens was, understandably, very pleased with the reaction of his readers to what he called, when the idea first came to him, "a very fine, new and grotesque idea”. Remy Naidoo as Estella and Michael McHugh as Adult Pip during a rehearsal for 'Great Expectations'. The finished work turned that idea into what one modern edition, published by Penguin Books, called "the novelist’s bittersweet understanding of the extent to which our deepest moral dilemmas are born of our own obsessions and illusions". This production for Balally Players, a stage adaptation written by Jo Clifford, was directed by Brian Molloy. 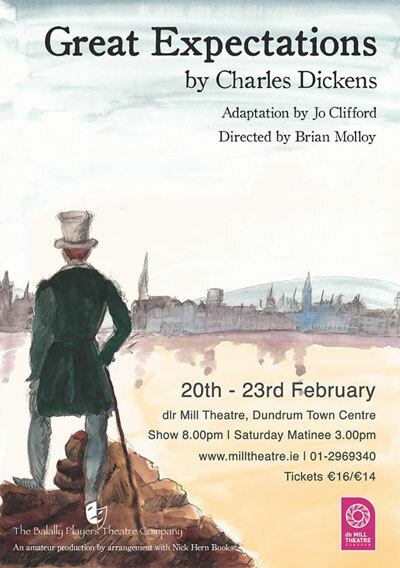 The play was on stage in the dlr Mill Theatre from Wednesday 20 to Saturday 23 February 2019. In addition to the evening shows, there was a Saturday Matinee at 3pm. A gallery of photographs taken at the dress reahearsal for 'Great Expectations' on 19 February 2019 is included on the page for play in the Productions section. 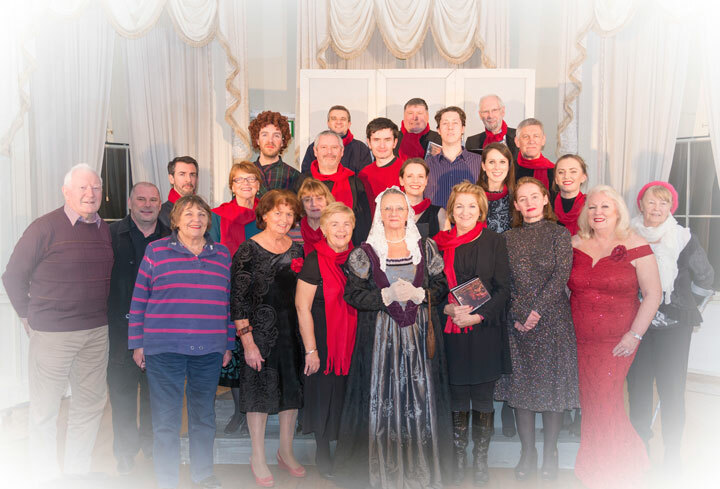 In the delightful setting of the Oval Room at Marlay House, Marlay Park, Rathfarnham, the Balally Players Christmas Show is the perfect way to start the Christmas period. The show is a delightful evening of seasonal sentiment in music, song, recitation, monologues and comedy. With tea, coffee, mulled wine and satisfyingly flavoursome mince pies at the Interval, it's a great evening for all the family. Since its inception, more than ten years ago, it has become a 'must see' event on the Christmas entertainment calendar. These photographs, taken at the dress rehearsal on Tuesday 11 December 2018, are stored in a SmugMug gallery '2018-Christmas-at-Marlay' (Photos: Declan Brennan). 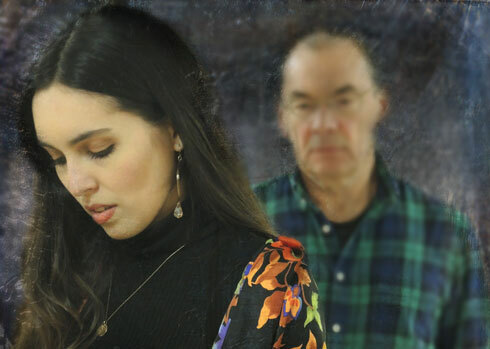 Presented by Rathfarnham Theatre Group, 'The Salvage Shop' written by Jim Nolan is in the dlr Mill Theatre from Tuesday 2 April to Saturday 6 April 2019 at 8 pm. The Salvage Shop is a drama about the fraught relationship of Sylvie and his son Eddie has forgiveness and redemption at its core. Sylvie is dying of cancer but still raging against the local brass band committee and still holding a grudge against Eddie, who left the band at a crucial time for its success. Eddie, meantime, strives to nurse his father; control his daughter and keep the family salvage business going. Struggling with regret and guilt he comes up with a scheme involving Sylvie’s idol, Pavarotti. This heartwarming play is permeated by snatches of powerful operatic tunes and arias that give the work a mythic quality. A copy of the flyer for the show is here. Admission: €15/€12 All Tickets €12 Tuesday Night. Reserve your seats at the theatre Box Office on 01-296 9340 or online at dlr Mill Theatre website. 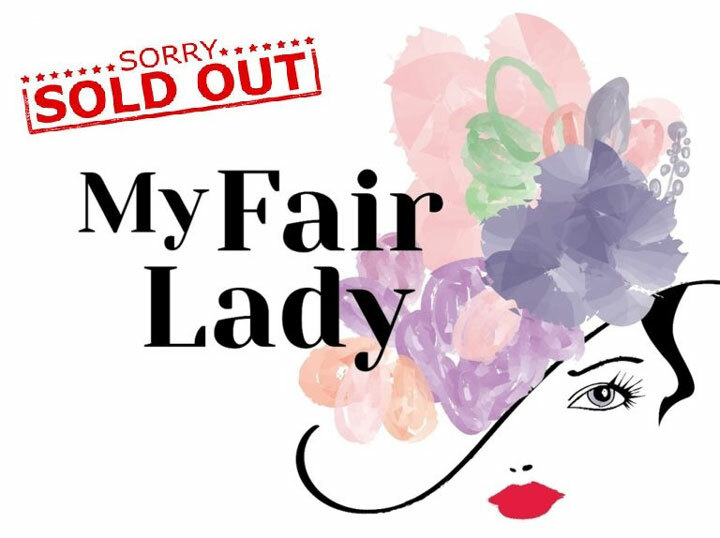 Following their sell out musicals, ‘Sweet Charity’ and ‘The Hired Man’ Glencullen Dundrum MDS presented ‘My Fair Lady’, Alan Jay Lerner and Frederick Loewe’s adaptation of George Bernard Shaw’s Pygmalion in the dlr Mill Theatre from 19 to 23 March 2019. For more see the group website. From 25 February to 15 March 2019, Mill Productions presented William Shakespeare's 'Romeo and Juliet', directed by Geoff O'Keeffe, in the dlr Mill Theatre. The daytime shows at 10am and 1:30pm, were for schools and there was one evening performance on Thursday 14 March. Gillian Buckle (Juliet) and Jack Mullarkey (Romeo). This modern take on the classic drama is full of energy and brings out the humour as well as the tragedy in Shakespeare's play. The story of the two young star-crossed lovers remains one of Shakespeare's most popular plays. The deaths of the young lovers finally brings about a reconciliation between their two families, who have been at war with each other for years. It was written early in Shakespeare's life and, together with Hamlet, it is one of his most frequently performed plays. The cast members are: Jack Mullarkey (Romeo), Gillian Buckle (Juliet), Michael-James Ford (Capulet), Serena Brabazon (Lady Capulet), Evelyn Shaw (Nurse), Ethan Dillon (Benvolio), Rachel O'Connell (Mercutio), Brian James Gilligan (Tybalt and The Friar). Set Design is by Gerard Bourke, Lighting Design by Kris Mooney, Sound Design by Declan Brennan, Stage Management by Claire O'Donovan. The company manager for Mill Productions is Karen Carleton. The dlr Mill Theatre is located in the Dundrum Town Centre, beside the Mill Pond. It opened in May 2006 with a production of 'Our Town' in which many Balally Players members participated. Since then the theatre has staged a wide variety of performing arts, community theatre, visual art, comedy, music, and children's shows. By including both professional and community productions in its programme, the theatre brings many people together both on and off stage. 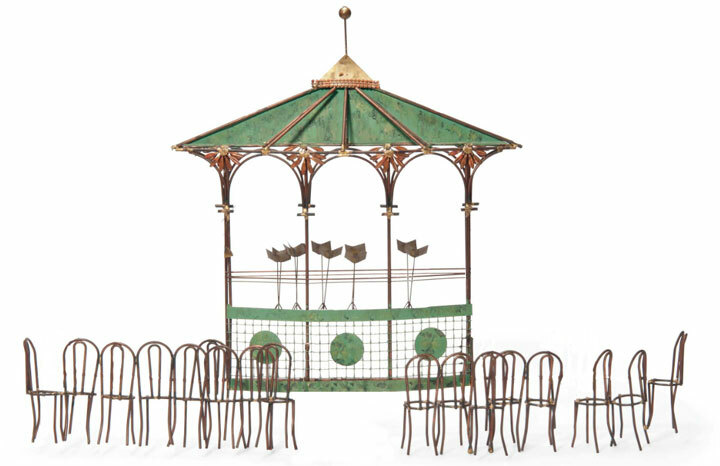 It has become a focal point of the community in South Dublin, a home for local groups and stage schools and a venue much loved by the many professional groups that have graced its stage. The dlr Mill_Theatre_website has all the information you need about the theatre itself as well as a comprehensive list of all the shows coming up. The theatre Box Office is open from Monday to Saturday between 12:30pm and 5:30pm and the theatre re-opens at 7pm when there is an evening performance. You can also phone 01-296 9340 to make a credit card booking. On the theatre website click the button beside your chosen performance and follow the instructions. You should note that there is a €1 booking fee per ticket for all bookings taken online and over the phone and you cannot choose your seats online, you are automatically allocated the next available seat. Call in to the Mill Theatre Box Office, which is open from Monday to Saturday, 12:30pm to 5:30pm. The theatre re-opens at 7pm when there is an evening performance. The telephone number to call is 01-296 9340. The information needed is the date and event you wish to attend, and how many tickets you require. If booking by credit card, you will need to give your card number and expiry date, your name and address. You should have an alternative date in mind, just in case your first choice is not available.